"Where's all this coming from?" Cleopatra has unveiled an official trailer for an indie romantic drama titled Modern Life is Rubbish, which played at the Edinburgh and Hawaii Film Festivals last year. The film is about a young couple on the verge of breaking-up. Brought together by their shared love of music, initially it was "opposites attract", but this didn't work for them long-term. Making the difficult decision to separate, they must split their prized music library. "But the sound track that defined their relationship keeps pulling them back together." Aww. Modern Life is Rubbish stars Freya Mavor and Josh Whitehouse as Natalie and Liam, with a cast including Tom Riley, Ian Hart, and Jessie Cave. This seems like a very smart, emotionally devastating look at modern love - and how complex it is. I also quite like the poster - see below. Brought together by their shared love of music, ten years on Liam and Natalie are at breaking point. In their case, opposites attract but don't necessarily work long-term. Making the difficult decision to separate, they must split their prized music library. But the sound track that defined their relationship keeps pulling them back together. Modern Life is Rubbish is directed by filmmaker Daniel Jerome Gill, making his feature directorial debut after working as an assistant director on films for years. The screenplay is written by Philip Gawthorne. This first premiered at the Edinburgh and Hawaii Film Festivals last year. 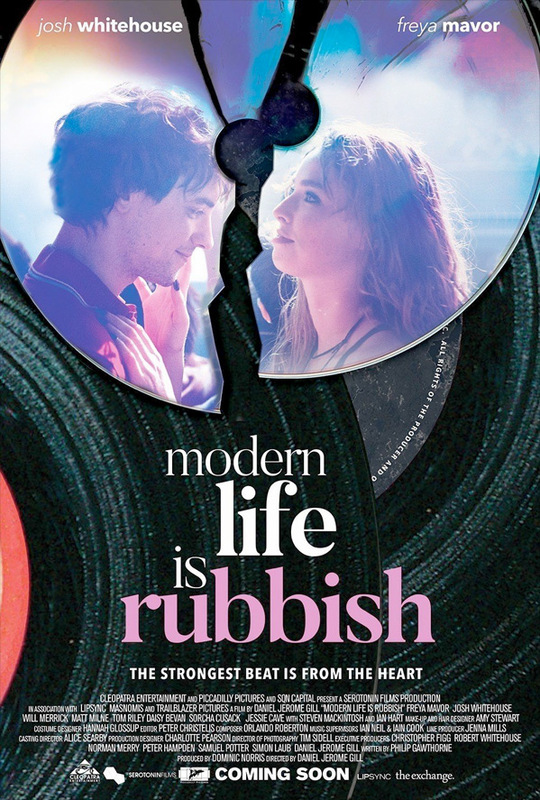 Cleopatra Ent will release Modern Life is Rubbish in select theaters starting on April 27th later this month.